I finally figured out Misty’s trick this week and I LOVE IT. It also inspired another trick that I want to share, which isn’t quite as cool but still handy. 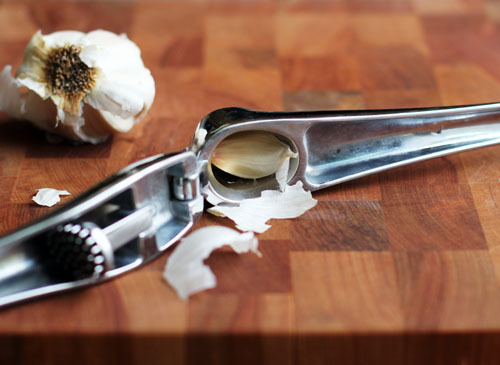 Misty’s Garlic Press Trick: When you use a garlic press put the WHOLE CLOVE, paper and all, into the press and then push it through like normal. Remember all that waste that Lindsay was so worried about? The paper becomes the waste that gets stuck in the press and almost every last bit of garlic gets pushed through. It’s like magic. Vampire Diaries-worthy magic. 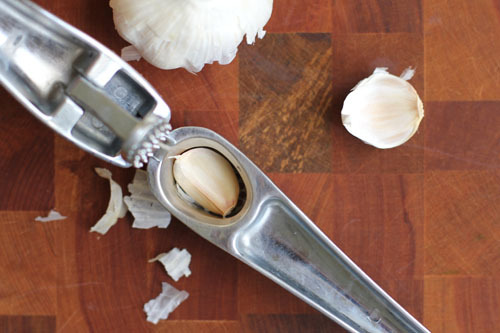 The other really cool part of this trick is that the garlic press is easier to clean when you use it this way. The paper doesn’t get all stuck in the bumps and grooves like straight-up garlic does. It’s so much easier to clean up! Put the whole clove in, with paper. Push it all the way through. Voila! Only the paper is left behind. 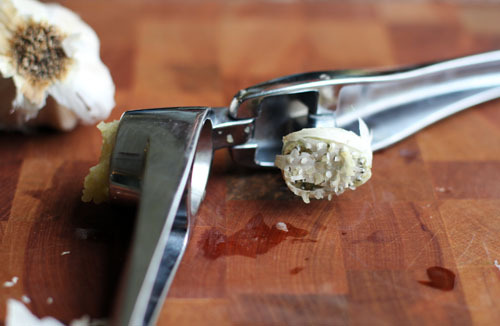 My Related Garlic Press Trick That’s Not Quite as Magical: Okay, so, you can also use your garlic press to get the paper off of your clove easily. Once again place the whole clove, paper and all, into the press. Then push, but not too far. Just enough to crack things up a bit. Remove the clove from the press and you should be able to easily peel the paper off the clove. Alternatively you can just smash the clove under the flat-side of a knife to get the same effect, which is what I normally do, but the press works great, too! Press about half way, remove the garlic clove, then pop off the paper! Happy mincing and de-papering of garlic! Please note: Garlic was harmed in the making of this blog post. In fact, I wasted one entire clove just for a picture. I didn’t use it for anything. I am a true garlic waster. I’m surprised I even care about this cool garlic trick at all. That’s awesome! When I need to peel a bunch of garlic cloves, I put them in a small stainless steel bowl and put another stainless steel bowl on top (making a circle/dome thing) then shake it like crazy. Peels come off like magic! I have a garlic truck too! I buy the frozen crushed garlic cubes from trader joes..work every time…ha! I’m such a lazy cook! How funny, I thought everyone knew to leave the paper on. I bought my from Pampered Chef and that was the key feature they talked about. I was sold right then and there. 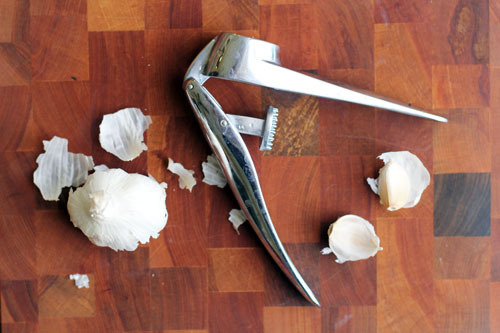 Love my garlic press, it is used a lot. 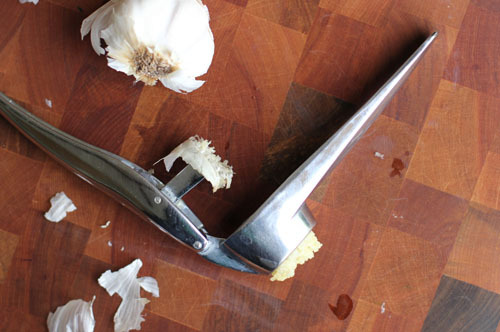 I have my grandma’s garlic press and stopped using it because of the pain of cleaning it, not the waste. Can’t wait to put it back to work! Ah! You just sold me on getting one of these things! I hate buying kitchen gadgets because they just pile up and I end up doing it the “old” way. But with all the garlic I mince, this is so worth it! 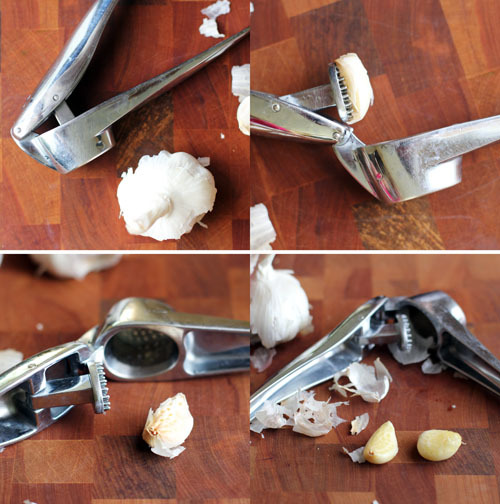 This sounds awesome, right now I use my microplane and that is such a pain sometimes and end up wasting garlic because I am to scared to hurt myself with it! that one is cool with the slicer!